Nezar AlSayyaad for reviewing prior to publication. Mecca—officially “Makkah”—is the holy city of Islam. Located in western Saudi Arabia near the Red Sea, in the sandy Valley of Abraham (Wadi Ibrihim), it is the birthplace of the Prophet Muhammed and site of the annual Muslim pilgrimage, or hajj, during the month of Dhu’l-Hijja. The city has held spiritual significance for the Arab people from before the rise of the three major world religions of Islam, Christianity and Judaism. Today, the sacred nature of this holy city is threatened by rapid residential and commercial development, which is also devastating to the fragile desert environment. The town of Mecca, from ancient times, has been an oasis in the Hijaz region of central Arabia. Located at the base of the Sirat Mountains, the Hijaz is a starkly beautiful strip of the Arabian Peninsula and the site of numerous sacred shrines, including about 300 sacred stones that represented pagan deities and were destinations of ancient pilgrimages. One of these was the Ka’baa, a black stone that could have been a meteorite, which later became the center of Islamic worship. The Arab people were polytheistic nomads who began to settle along the Hijaz around 400 B.C., and it became a natural caravan stop. Local people also revered the hills of Marwa and Safa and a freshwater spring called Zamzan. The Arab tribes prospered in the desolate landscape and many of their traditions, including restrictions on animal grazing and building on the sacred hills, protected their lands and waters from pollution and erosion. Some of the same places that were sacred to Arab tribes have acquired significance in the debate around the origin stories of Islam, Judiasm and Christianity. Islamic and Arabic tradition teaches that when Adam and Eve were cast from Paradise, Eve fell to earth near the Red Sea, where the port of Jeddah now lies. After she and Adam (who landed in modern-day Sri Lanka) had wandered many years alone, God reunited them on Mount Arafat. One verse of the Koran suggests that the valley was then called Baca or Becca. Scholars debate the origins of the name, some believing that it is from Baka’a or Bakkah (Arabic for ‘lack of stream’), perhaps referring to the time before the discovery of the Zamzan spring. Others claim it means “valley of weeping.” Some Christians and Jews believe that a reference in the Book of Psalms to Ba’ca could be Mecca, but others insist the Bible never refers to Mecca and that Adam could not have been in Mecca. According to Arab beliefs, Adam was buried in Mecca while Eve was buried in nearby Jeddah (jiddah means matriarch in Arabic); the major religions variously teach that they are buried in Hebron in the Cave of the Patriarchs or on the Temple Mount in Jerusalem. During the Biblical flood, Noah’s ark passed around the disinterred body of Adam seven times—an event now ritualized in the circling of the Ka’baa during the annual Muslim pilgrimage. Islam teaches that Abraham and Ismael built the Ka’baa shrine where the angel Gabriel instructed them and that the angel brought the Ka’baa and the people prayed at the stone. Also, Abraham’s wife Hagar was said to have nursed Ismael to good health with the waters of the Zamzan spring. In Islam, Zamzan is one of the rivers leading to Paradise. Up until Muhammed’s time, the Arabian Peninsula was a polyglot place where many religions held influence, including animism, Judaism, Zoroastrianism (from conquering Persians), and early Christianity. During the Roman and Byzantine empires, the city of Mecca was known as Macoraba and its stature as a trading place grew as more and more pilgrims visited the shrines. When Muhammed began to preach in 610 in Mecca, he perceived that the proliferation of beliefs spurred sectarian violence and immorality that only a monotheistic and strict, devotional practice could alleviate. Allah (“God” in Arabic) was the dominant force among the Arab deities. After many battles with the Meccans and other peoples across the Arabian peninsula over the next decade, Muhammed and his followers conquered Mecca. The Prophet declared: “Men, God made Mecca sacred the day he created the heavens and the earth, and it remains sacred until the day of the resurrection. Anyone who believes in God and the last day is not allowed to shed blood in it or cut trees. This was not lawful to anyone before me and will not be lawful to anyone after me except at this time because of God’s anger at the people. But now it has returned to its former sacred status. So you who are present should tell those who are absent.” Muhammad destroyed the pagan idols including the Hubal, a giant stone atop the Ka’baa, but not the statues of Mary and Jesus. Muhammad combined some ancient Meccan rituals with the Hajj pilgrimage to Mt. Arafat and declared Mecca the center of Muslim pilgrimage with the Ka’baa as its most sacred site of worship. He worshipped there just before his death in 632. After Muhammed’s death, merchants and missionaries spread Islam across what is now called the Middle East, into northern and western Africa, across the Mediterranean and east to Persia under a succession of caliphs (political leaders) starting with Caliph Abu Bakr. Two centuries after the settlement of nomadic Arabs, the faith of the city had changed, and Mecca had become a sacred city not only to the Arabs, but to many millions of people around the world. The conflict for the leadership of the Muslim umma (community) between 656 and 680 led to the Sunni/Shi’a schism that exists to this day. As the umma became larger and more prosperous, the Ka’baa in Mecca was gradually enlarged and ornamented until it became the largest mosque in the world. Despite being held by many empires from Egyptian Mameluks to Ottoman Turks, and finally the Saudi royal family, the city remained the holy focus of Islam and entry is restricted to Muslims. Today, Muslims around the world orient themselves in the direction (qibla) of Mecca during prayer. The hajj, or pilgrimage to Mecca, is one of the Five Pillars of Islam, required of all Muslims who can afford to make the trip at least once in their lifetime. Many Muslims also make the Umrah, the minor Mecca pilgrimage, at other times throughout the year. The Koran (Qu’ran), the holy book of Islam, calls all Muslims to make the Hajj: “And pilgrimage to the House is a duty unto God for mankind, for him who can find the way thither” (3:97). An estimated 1.3 billion people are practicing Muslims, although only around 20 percent of them live in the Middle East. The hajj is a time when Muslims from a wide range of nations and cultures journey to Mecca to experience spiritual renewal and the unity of Muslims worldwide. Those who are able to make the pilgrimage may add Hajj or Hajji (El-Haj, La Haji, etc.) to their names, which merits great respect in their home countries. The Haram al-Sharif (Noble Sanctuary) is the focus of the hajj as it contains the primary sacred sites of the Ka’baa, the Zamzan well, the Hijr and the hills of Safa and Marwa. With seven minarets, 64 gates, and 160,000 yards of floor space, the sanctuary can hold more than 1.2 million pilgrims at one time. From the time of arrival in Mecca to their departure ten days later, pilgrims follow a time-honored path from station to station. The ritual walk between the hills of Safa and Marwa symbolizes the journey of Hagar and Ishmael to find water, just as man seeks the will of God. Beginning six miles from the Ka’baa, at the edge of the city, pilgrims don simple sandals and the white garments of purity (a symbol both of entering the spiritual state of ihram and becoming one with the classless, nationless, genderless crowd). The focus of the hajj is the Ka’baa, around which pilgrims circle seven times before touching and kissing the Black Stone. They then pray toward the Station of Abraham and proceed for the next week to walk to various sites in the Valley of Abraham before returning to the town of Mina. There, at the city boundaries of Mecca, Eid al-Adha (the Feast of Sacrifice) is celebrated to commemorate Abraham’s sacrifice of his son Isaac. After the feast, pilgrims return to the Haram to once again circle the Ka’baa and then they leave the state of ihram as their heads are shaved. Every year some four million pilgrims per month descend on Mecca, most arriving at the bustling port city of Jeddah. Although the Saudi government has made many efforts to maintain the holy sites and control crowds, there have been disasters over the years, including stampedes and bombings that have cost the lives of many pilgrims. The threat to Mecca as a sacred place is modern residential and commercial development. New construction is causing the destruction of historic Islamic buildings and is commercializing the holy city. 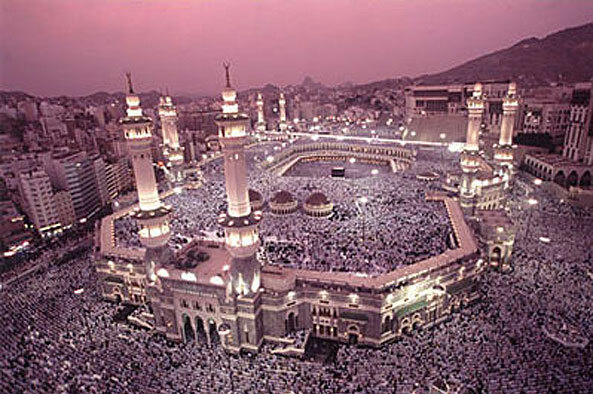 Mecca has not just one, but many hundreds of sites that are important to Muslims around the world. Throughout its tightly wound streets, one can find a home of the Prophet Muhammed as well as birth and burial sites of many important Muslim figures not far from the revered Ka’baa. But these sites are being bulldozed for large apartment buildings and commerical complexes that the leadership of the city hopes will house and cater to a growing number of affluent pilgrims. The number of pilgrims visiting Mecca annually is anticipated to skyrocket in the next few years due to the kingdom’s changes in rules of entry and national quotas for pilgrims. In 2005, King Abdullah launched six massive new development projects near the Grand Mosque, including the Jabal Omar residential towers, which include five-star hotels, commercial centers and prayer facilities for 200,000 worshippers. Another project begun in 2006, Jabal Khandama, will be built on one of the city’s four sacred hills and will have two times the footprint of New York’s Empire State Building, with luxury apartments, hotels, restaurants and shops. These developments are seen as King Abdullah’s effort to radically alter and modernize the 21st century landscape of Mecca in order to leave a royal legacy, much as previous kings built higher minarets and made the Haram more comfortable and accessible to pilgrims. There has been no official protection of historic sites because the ruling family and its religious court are dominated by Wahhabists—those who follow the strict teachings of Ibn Wahhab, one of the spiritual and political founders of the Kingdom of Saud. Contemporary interpretations of those teachings hold that sites other than the Ka’baa should not be held sacred because that would be tantamount to idolatry. A 1994 edict from the Kingdom’s religious council declared that the preservation of historic buildings would promote polytheism. However, Wahhabism is just one sect in the Islamic faith, so many other Muslims around the world feel that such sites should be preserved, not to idolize them but to protect a rich Islamic heritage. Sami Angawi, an architecture expert who runs the Amar Center for Architectural Heritage in nearby Jeddah and who is a descendant of the prophet Muhammed, became well known in his fight to preserve historic religious sites around the city. He argues that developers are harming the sacred nature of the city in order to turn a profit, capitalizing on the enormous number of pilgrims who flood the city each year during Hajj. “Mecca is being treated like a bad copy of any city, when it is a sanctuary,” Angawi said. “The house of God is being commercialized and these developments are disrespectful and totally out of proportion.” Angawi estimates that 300-plus historic buildings have been demolished since the 1960s in Mecca and Medina. His only recourse to protect sites, such as the presumed home of Muhammed, is to refuse to reveal their locations to the government, because he fears the sites would then be targeted for demolition. The environmental consequences of this massive, new development have not been publicly assessed. Saudi Arabia is largely a fragile desert environment where population increase and modernization of buildings has led to a large increase in energy consumption, as well as air and water pollution. In earlier times, Arabians maintained a balance between their use of resources and conservation of the environment. The discovery of oil in the early 20th century brought about rapid changes in the lifestyles and attitudes of Arabians to the desert. The population boom has led to growing demand for meat and dwindling water supplies—which in turn cause overgrazing by cattle in the delicate desert landscape. As Saudi Arabia has developed during the past century, greater numbers of Saudis and foreign workers have moved to urban industrialized areas, including Mecca. Rural area have been primarily used for resource exploitation and as repositories for industrial waste, leading to the destruction of native flora and fauna. As the urban population continues to swell, water and sewage infrastructure has not been adequately expanded and modernized, which has resulted in frequent seepage of sewage. Many Saudis are not taught about the effects of industrialization and urbanization on the environment. In general, popular and government attitudes regard protection of the environment as a costly policy that will adversely affect the economy, which is heavily dependent on petroleum production and export. With world oil demand ever on the rise, the volume of oil being shipped through pipelines and via tankers is increasing and the chance of spills and accidents continues to grow. Despite its limited power, the Amar Center has been working to protect the Islamic architectural richness of Mecca, particularly lesser-known sacred sites, by advocating for responsible development and by opposing large developers. There are new regulations on pollution and positive changes in the policy of the government to protect citizens’ health and to promote environmental awareness education, including a directive to Islamic authorities to teach environmental protection from the Muslim viewpoint. In 2001, the Saudi government finally introduced unleaded gasoline, contributing to a major improvement in the nation’s air quality. Saudi Arabia is also a signatory to many international environmental accords. The Council of Saudi Chambers of Commerce and Industry announced the first initiative to define Saudi Arabia’s environmental strategy for the 21st century. According to the World Bank, the country will have to invest substantial capital in the environmental sector in coming years in order to become more sustainable. Although the government appears to have begun addressing many environmental challenges, there are few strong, influential voices in the royal family affirming the importance of these issues and there is little that Saudis or outsiders can do to demand environmental assessments of new development or to prevent irresponsible development. Butler, Rhett. “Saudi Arabia Deforestation Rates and Related Forestry Figures.” Mongabay. Farnsworth, Elizabeth. “Inside the Kingdom, Part III.” Online NewsHour, February 19, 2002. Hitti, Philip K. History of the Arabs. Palgrave Press, 1970. Inside Mecca. DVD. Directed by Anisa Medhi. National Geographic video, 2003. Renard, John. Seven Doors to Islam: Spirituality and the Religious Life of Muslims. University of California Press, 1996. “Country Briefing: Saudi Arabia risk.” RiskWire via Thomson Dialog NewsEdge, June 26, 2006.